One of the greatest challenges that every brand faces as they try to grow is figuring out how to find and gain exposure from a relevant audience. In the past, brands have had to rely on poorly targeted marketing campaigns. However, thanks to the growing popularity and influence of content creators on platforms such as Instagram and YouTube, influencer marketing has emerged as a highly effective way for brands to find relevant audiences and promote their offerings. Influencer marketing can be especially impactful for pre-launch or early stage brands who are yet to build up a significant following and need a trustworthy representative to help them spread their message to an audience and drive action. Influencer partner campaigns involve you offering a prize or reward such as a product or store discount to incentivise users to complete a variety of actions. The influencer will then promote the campaign to their following, providing them with some valuable content and allowing you to tap into their sizeable audience. The actions you incentivise will be a mix of actions which benefit you, and actions which benefit the influencer, allowing both parties to gain significant value from the campaign. If you want to partner up with an influencer to run a campaign the first thing you'll have to do is find a good influencer to work with. How closely aligned the influencer's audience is with your target market. How well the influencer engages with their audience. Searching for influencers can be a laborious task, but it's worthwhile to find a powerful influencer who can expose you to a relevant market and help take your business to the next level. Simply search for your brand's name on your target platform. If you already have a target platform you know exactly where your market hangs out. If not, it's worthwhile to try all major platforms like Instagram, Twitter or YouTube. Revolut realised that an influencer with a strong and relevant following was advocating their brand online, so it only made sense for them to publish a blog post to gain further attention from like-minded individuals. Another great way to find desirable influencers is by searching through hashtags relevant to your brand and audience. From these posts, see if you stumble on any influencers with a sizeable following who you would like to partner up with to run a campaign. You can start with a handful of keywords that you think would be relevant to your product and then branch out your search based on what users are also tagging alongside your keyword. For example, if you are looking to promote a healthy food product, you might search for #healthyeating. Then, as you browse on, you might come across overlapping keywords such as #wholefoods, #cleaneating and so on. It's easy to see an Instagram account with a high number of followers and assume that they are a valuable influencer but you need to remember that number of followers is a vanity metric - the true value in an influencer's work lies in their ability to persuade their followers to take action. Once you come across content that looks good and potentially matches with your brand, you can have a look at some more meaningful statistics to determine the influencer's ability to engage with their followers. Ideally you can get an average based on a number of posts from the influencer, then compare that average with your own performance. Are their engagement rates higher than yours? In that case it might be a good idea to partner up. If the influencer has been sponsored by other brands previously, have a look at those brands and see if they are serving the same niche as you are. It doesn't have to be a product or service similar to yours. As long as they are catering to the same audience to yours, chances are you'll receive better reception and engagement from that audience. While number of views can differ based on many factors, such as the time of publishing, you should beware when number of views differ too much. As a rule of thumb, pageviews should be consistent by having the same number of digits. If an influencer is able to reach 5,000 views in one post, chances are the others should be within the thousands too. Since regulations for influencer marketing are fairly limited, reliability is extremely important when it comes to establishing trust between both parties. For that reason, you want to make sure that the influencer posts regularly or has some sort of content schedule to ensure they will post your content as promised. A simple question like What are your posting schedules like? should give you a good idea on how they plan out their content as well as how often they post. You can also have a look at the publishing dates of their content and see if there is a pattern. Tip: Try using a calendar and tick the days when an influencer posts. You may be able to see if they post on select days. For example, Mondays, Wednesdays and Fridays. This could give you a hint on when they think their audiences are the most active. Finally, is there a healthy sense of interaction in general? Watch out for the comments area, if it's filled with generic responses such as Love this! or Nice one! - chances are they are being posted by bots. Another thing to note is if the influencer themselves comment back when they receive comments from followers. If they barely comment back, the relationship is one-sided and may affect engagement rates. Once you've identified a handful of influencers you want to work with, it's time to reach out to them and establish a partnership. Influencer marketing may still be a young industry and anything goes, but it's still important for both parties to remain professional and courteous. What you offer an influencer will depend on how much engagement they can pull in for you and how many users or customers you have the potential to acquire through the campaign. If the influencer has a small to mid-sized following, chances are the campaign is as important to them as it is to you. It gives them some valuable content to engage with their audience as well as driving the actions they need to further grow their audience. For this reason, it's possible to offer something as simple as free products and campaign actions in exchange for the endorsement. If you are working with an influencer who has above 100k followers, then you might want to consider topping up your offer with cash to catch their attention. Influencers get a lot of offers on a daily basis, so you could either state your offer or ask for their rates. This helps capture their attention and to show that you are serious about the collaboration. Typically influencers would leave their contact information in their profile page or landing page. If you can't find their contact information, a simple direct message on the platform itself would do. There's no need to be too formal when it comes to messaging an influencer, especially when it's on a direct message platform. Just make sure you are polite and focus on the influencer instead of yourself. Let the influencer know why you would like them to endorse your brand or product. You can also highlight some of the Gleam actions you think would benefit the influencer to get their attention. For example, if they are a YouTube influencer, they can get more people to visit their channel, follow them on social media and much more. We're working on a new campaign for our new initiative and we'd like to explore opportunities to partner up with you for a giveaway/discount campaign. We'll be using Gleam to host our campaign, you will be able to get more followers on platform or grow your mailing list alongside us. We'd like to state offer. Are you interested? Once you have found an influencer to partner up with it will be time for you to create and run your campaign. With Gleam Competitions you can run joint giveaways with influencers or micro-influencers which allow users to enter the draw to win a prize by completing a variety of actions that are valuable to both you and your influencer. Joint giveaways can be promoted by both parties. When deployed at the right time and to the right audience, they can be extremely beneficial and cost-effective for both parties. 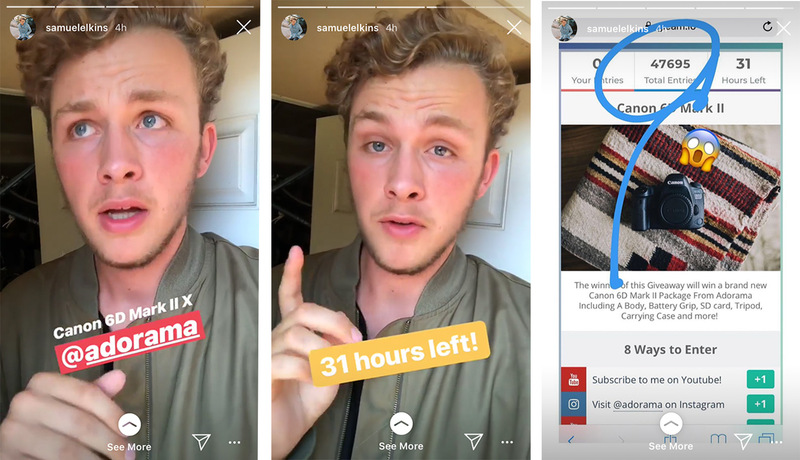 Camera retailer Adorama had great success with this type of campaign when they partnered up with YouTuber Samuel Elkins to promote their business. Adorama offered up a camera as a prize for a giveaway campaign celebrating Samuel Elkins hitting 100k subscribers on YouTube. When you run a campaign one of the most important decisions you will have to make is deciding on what actions you want to incentivise, as this is where a large portion of your value will come from. Remember: the actions you include in your campaign should be benefiting both you (the sponsor) and the influencer you partner with. To help you get your campaign underway we've put together a list of some of the most valuable actions you can use to capitalise on your exposure and grow your business as well as those that influencers can use to grow their own followings and engage their audience. Legality of Enter with Purchase method varies from country to country. Make sure you are not violating any No Purchase Necessary laws applicable to your country for this entry method. Find out how you can mitigate that and run a regulation-compliant campaign in our Complete Guide to No Purchase Necessary Laws. At the crowdfunding stage? Have users visit your Kickstarter or Indiegogo page and stand a chance to grow your project funds. Driving traffic to your website is essential in having your brand known as well as your product offerings. If you have an online store, this is the perfect chance for a plug too. With our Coupon action you can offer users discount codes to use at your store from inside your giveaway. This is an outstanding way to incentivise purchases and convert contest entrants into customers. When you use the coupon action it's generally a good idea to take advantage of the actions required setting and make users complete a few actions before unlocking the coupon. This will help you encourage users to complete more actions and maximise the effectiveness of your campaign. 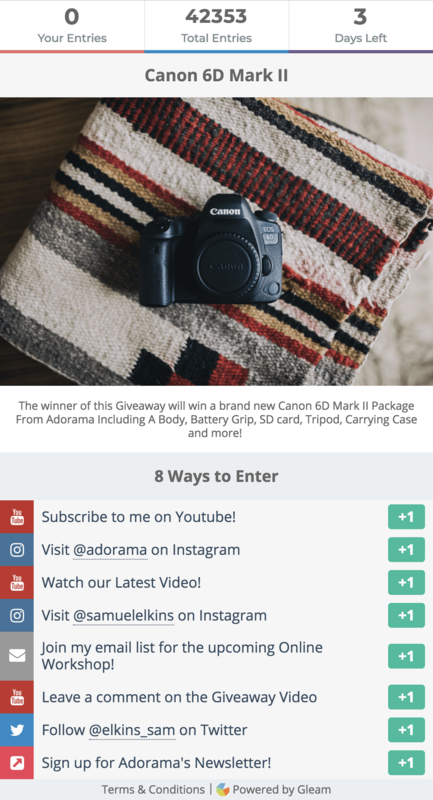 A great way to get an influencer's fans involved in the giveaway is by awarding entries to users who visit their YouTube channel. YouTube is an incredibly popular platform amongst online influencers so awarding entries to visitors is a great way to boost participation. The actions that will be most beneficial to an influencer depends largely on what platform they operate on. For example, if you partner up with a Twitch streamer you may want to include a few Twitch actions in your campaign. To add a referral element to your campaign, you can also add a Viral Share action to encourage users to share the campaign with friends and family to earn extra entries. This is a great way to exponentially increase the audience of your campaign. A successful referral means the referred has also entered the competition. They must have at least completed your mandatory actions for the original entrant to receive additional entries. A special type of campaign you can run with Gleam Competitions is an interactive photo contest. 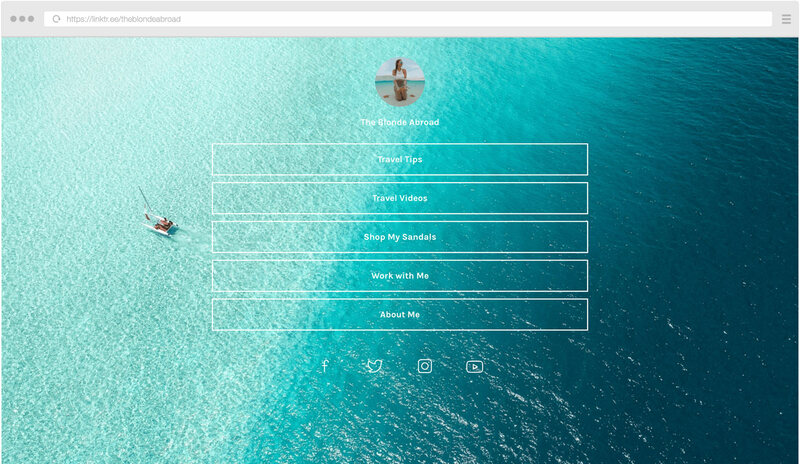 This is an outstanding way to engage with your influencer's audience and collect a wealth of user-generated content that you can use in your future marketing activities. If you have an ongoing partnership with an influencer, your brand becomes a household name to the influencer's audience. Being familiarised means there are more opportunities for you to engage with the audience and spark them to take action. Find out everything you need to know about running your own engaging photo contest. The prize you offer is one of the most important components of your giveaway. Your prize is what will encourage users to enter and get people interested in your campaign, so it's important that you get it right. Generally speaking, your own product is the best prize you can offer. This is because offering up your own product as a prize is the best way to ensure that you are driving actions from users with a genuine interest in your brand rather than those who are simply entering to win a generic prize. It's also important to ensure that your prize is relevant to the influencer's audience, but if you have chosen an influencer who is appropriately aligned with your brand then your product should already be highly relevant to this audience. This is a high-involvement approach, but if you are partnered with a hugely popular and influential figure it can be well and truly worth it. 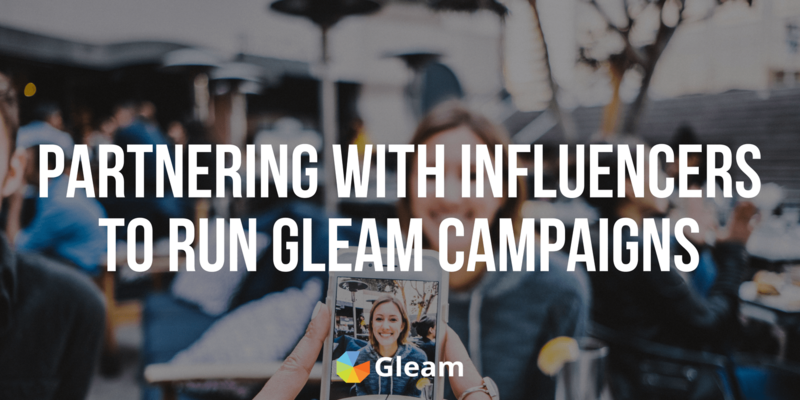 Another type of campaign you can partner up with an influencer to run is a Gleam Rewards campaign. Rewards campaigns function similarly to Competitions, except instead of completing actions to enter the draw to win a prize users will be able to receive instant rewards such as discount coupons when they complete actions. Rewards campaigns can be particularly effective if you are trying to drive sales. This is because by offering up discounts to anyone who completes your designated action you won't only be able to incentivise a host of powerful actions, you will also be able to encourage the highly relevant audience you reach to make purchases by offering up your products at discounted prices. Offering discount codes as part of a Rewards campaign is extra effective when you are able to use influencers to spread your campaign and distribute discount codes. This is because customers are more primed to make a purchase when they see a recommendation from an influencer they follow. Regardless of what actions you want to drive, having influencers promote your Rewards campaign is a sure-fire way to get more out of your campaign. If you have a product that is relatively cheap to ship, you may want to consider giving out free samples for potential customers to try. This works great for food or beauty/grooming products. Free samples work especially well when paired with a product review from your influencer of choice. This could be in the form of a YouTube video, Instagram Story, or blog post. When you run a campaign to give out free samples it's harder to incorporate actions which will directly benefit your influencer. However, by giving them the opportunity to distribute free products to their audience you are still providing them with great value. Also, be aware that due to the extra costs incurred in shipping and handling, this method may be more suitable for businesses who have a local audience. It would be even better if your influencer is also from the same region. Gleam Rewards can help you collect user information and also facilitate social follows when they agree to get a free sample from you. Besides being able to collect the user's shipping address, you can also capture their email to grow your mailing list. Using our hosted landing page, you can simply have your influencer link to your unique campaign page in their Instagram bio for viewers to claim the free sample. The fact that we have a unique page for each campaign generated on Gleam makes it so easy and painless for anyone to funnel a highly targeted audience into specific campaigns. This greatly increases your return on investment by driving a highly relevant audience straight to your offerings. As you go about setting up your Competition or Rewards campaign it's essential that you setup appropriate expectations for both parties before commencing the campaign. This could be in the form of a contract that highlights the itinerary or schedule of activities to be expected and executed by both parties. 📦 Who will be sending out the giveaway prize or free product samples. Usually, this will be the sponsor's responsibility. ✏️ Content or assets to be created by the influencer, as well as the creative rights to the content. 📃 The term of the partnership. For example, you might want to include a renewable contract to work with the influencer again should you be happy with their work. 💰 Method of compensation. It could be a fee paid upfront, or commission-based where the influencer receives a percentage when they manage to influence a sale. 💡 Gleam actions to be included in the campaign. For example, should the actions be leaning towards the sponsor or should they be in a 50:50 ratio? ⏳ When the influencer should be compensated. If you are offering cash, the industry standard is to pay a 50% deposit upfront. Now that you've setup a campaign that's ready to go, it's important to prepare an exhaustive list of creative assets as well as a promotion schedule for both parties. Ideally this should be done via email so you have clear evidence of the exchange as well as for ease of reference. We recommend having your influencer share the hosted landing page for your joint campaign regardless of which platform they are on. Spread the word on all of your social media platforms including Facebook, Twitter, Instagram and any other platforms you have an active presence on. Send out emails to your mailing list to promote your campaign. Make sure to highlight the promotion you are offering and how users can enter the campaign on Gleam. Run a Facebook Ad. Facebook has a powerful audience targeting system you can take advantage of, so run an ad that links users to your Gleam campaign. 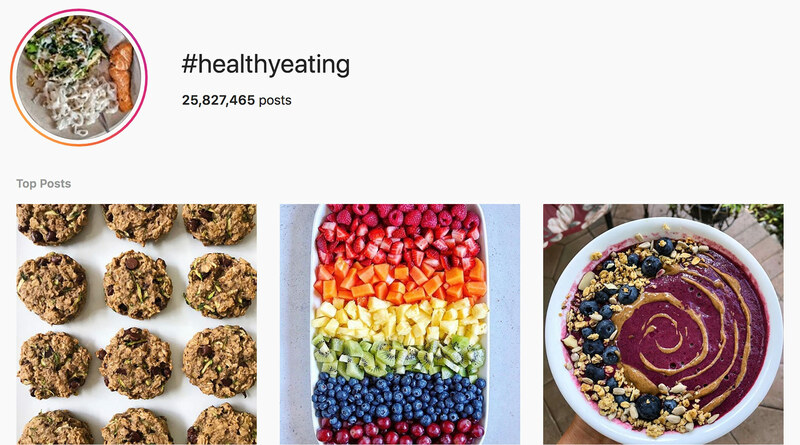 If your influencer has more than 10,000 followers on Instagram and has a Business account, chances are you can do the same too. We offer integrations with Google Analytics for users on the Business plan and above. Integrating Google Analytics to your campaign gives you better visibility of the campaign's performance and how each influencer is performing. This is especially important if you are working with multiple influencers for a time frame and would like to know who to collaborate with again in the future. For higher granularity, you can also setup a Goal to track the conversion rates from each influencer's audience. Integrate your Gleam campaigns with Google Analytics to dive deep into campaign performance. Another important thing to note is to ensure your campaign is compliant with the Federal Trade Commission's (FTC) guidelines. The FTC states that when there is an exchange of value between an influencer and a brand, the relationship has to be clearly disclosed. Although there are no hard and fast rules on how the relationship should be made clear, the influencer can opt to either tag their post with #ad or #sponsored, or by making a disclaimer at the start of a video. So long as the disclaimer is not obfuscated, both parties are good to go. Notice how the post above has #sponsored clearly tagged in the first comment, whereas other relevant keywords for the post are inserted in the second comment, making sure that #sponsored does not disappear under the fold. Depending on your promotion platform, there might also be additional guidelines enforced by the platform itself. Some platforms would have explicit guidelines whereas others may not. To be sure, always contact the platform's advertising team before proceeding. Once your campaign is set in motion the best thing you can do is analyse its performance and watch your audience grow. Gleam comes with built-in analytics so you can keep track of how well your Competition or Reward campaigns are performing. Keep a look out on the days your influencer starts posting about your campaign on their platforms. 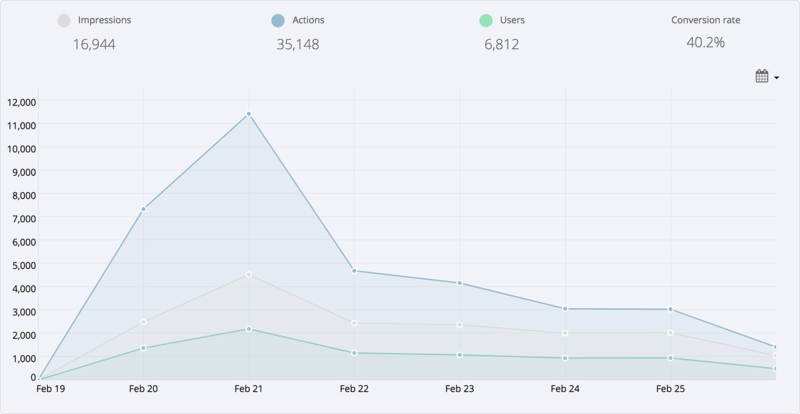 Are there spikes in impressions and actions? 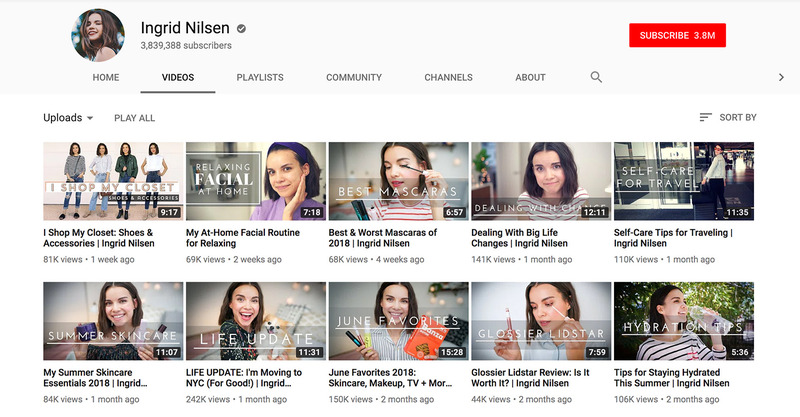 If your influencer is going to promote on multiple platforms, it's advisable that you space out promotion between platforms on specific dates so you know which ones are performing better. You can use Gleam's Referrer Reporting to see which landing page and referring sources are driving traffic and conversions for your campaign. This is fantastic for determining the effectiveness of your influencer partnership. Understanding the effectiveness of your influencer's promotion will allow you to make informed decisions about future collaborations and help you maximise the effectiveness of your campaigns in the future. You might also want to look out for the number of users your campaign participating in your campaign and the number of followers the influencer has. What's the conversion rate like? Do they match up? If the difference is overbearing, it's possible the influencer is buying followers so you're not getting your return on investment. In this case it's not recommended to continue working with the same influencer. The influencer is obligated to share any relevant campaign metrics with the brand owner for the duration of a campaign. This includes reporting from Gleam as well as analytics data from relevant platforms. Fortunately, Facebook and Instagram both come with branded content policies which ensure you comply with FTC guidelines as well as access to post-level statistics. This means that if you partner up with an influencer to create and post content, you are required to perform a 'handshake' on the platform before publishing. Once the 'handshake' procedure is completed, you are able to access the influencer's statistics for the particular posts being endorsed. If you're working on a platform that does not provide direct access to post statistics, you could have the influencer agree send you screenshots of relevant campaign statistics. Just make sure this is bound by a legal document before the campaign commences to ensure delivery. Analytics data can also be time-sensitive, make sure you or the influencer make a copy of the data before they expire. For example, Instagram Stories expire 14 days after the story is posted. In the aftermath of your campaign you will likely be left with a whole lot of new followers with a piqued interest in your brand and product. This is the perfect time to focus your efforts on re-engaging these followers to solidify their following or launch a follow up campaign to drive further action such as sales. Maintaining an active and interesting presence on social media one particularly effective way to continuously engage your new audience and convert them into loyal followers and customers. If you want to drive some immediate sales then it's a good idea to run a sale or giveaway some discount codes. You can easily do this by sending out an email containing a discount code to all Competition entrants or by running a follow up campaign with Gleam Rewards. This is the perfect way to capitalise on your new audience and leverage the excitement your influencer campaign generated to drive further action and sell your product. If your partner campaign was a success then you should try to maintain your relationship with the influencer. They have already added value to your promotional efforts once and chances are they can do it again. Whether you want to run more partner campaigns in the future or simply try to get the influencer to post or talk about your product, having an influencer on your side is always a powerful commodity. Signup and start creating campaigns with Gleam.